SANTA CATALINA ISLAND — Last year, 35-year Catalina Island resident Jerry Dunn decided to undertake a project in memory of his brother and photographer Edward Dunn, who died of cancer in 1999. He sent out word to photographers and lovers of Catalina to submit their favorite photos of the island. Dunn planned on sifting through the submissions to create a photo book covering all of the splendor Catalina has to offer. on the island, quickly realized he had a big job on his hands. “We were overwhelmed with the amount of photos we received,” Dunn said. He developed focus groups with his wife, Kelly Rowsy; graphic designer Kirsty Moyser; and other Island Venture employees, to decide what photos would make the cut. “We would pin them against the wall, vote on them and remove the ones that didn’t make the cut. We kept whittling it down that way until we got to the final 300 photos that went in the book,” Dunn said. One year in the making, the final product is now complete, and the “coffee table book” is now on his store’s shelves. The 12- by 12-inch glossy white hardcover book will retail for $75, and 100 limited-edition cloth-covered books with gold embossed lettering will be available for $300. A portion of the proceeds from sales of the book will be donated for prizes in the photography division at the Catalina Island Festival of Art. “The idea is to ‘pay it forward’ in memory of my brother, Ed,” Dunn said, who noted that Ed was a member of the Catalina Art Association and an award winner in previous Catalina Island Festival of Art competitions. While the book is dedicated in memory of his brother, Dunn got the idea for the book from a trip to Harbour Island in the Bahamas, where he and his wife stumbled across a photo book dedicated to the entirety of the island. “Every time we open it up and look at it, we kind of go back to Harbour Island,” Dunn said. He hopes his Catalina version will evoke the same feeling for others. Dunn, who moved to the island at age 22, believes the book will be a hit with anyone who has visited Catalina, because it has something for everyone to relate to. 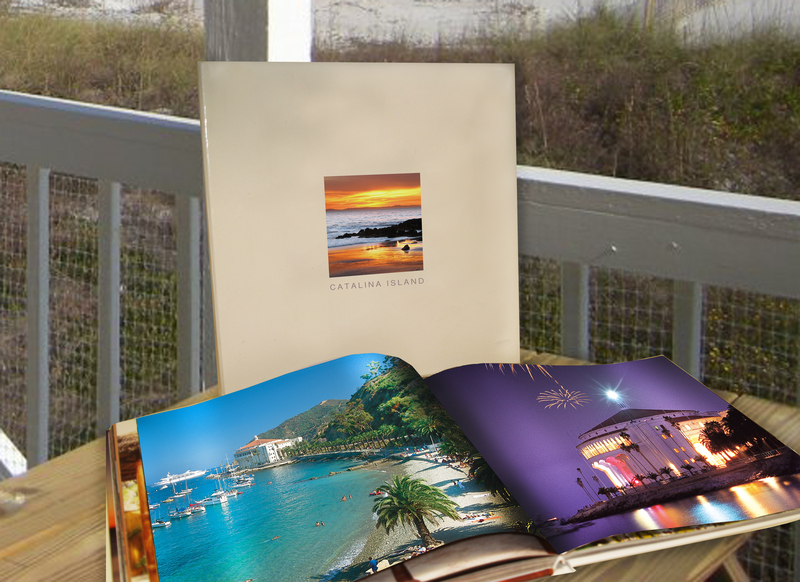 Unlike other books focusing on Catalina’s history, the photo book centers around the present state of the island, and it includes all aspects of Catalina — not just the town of Avalon and the picturesque Casino building. Pictures were sent in from more than 50 professional and amateur photographers from all over California, and some photos were even received from photographers in Washington and Hawaii. A list of the photographers whose photos were used for the book will be included, along with captions detailing certain scenes, little-known Catalina facts or historical references. Orders can be placed for copies of the book. For more information, call (310) 510-0416 or visit buoysandgulls.com.